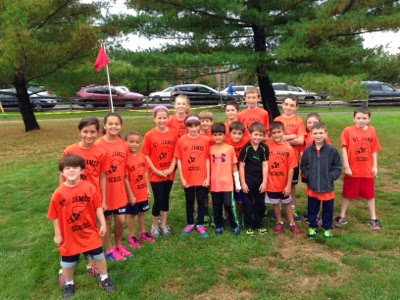 We lucked out as the heavy morning rain cleared for our second meet of the season, hosted by Assumption at Loantaka Park in Morris Township. There were 16 schools present, with nearly 400 runners competing. We had 24 runners join us, with some impressive performances. Congratulations to all runners! 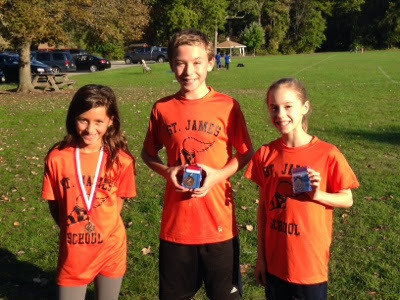 Specific congratulations to our medalists; Athena Bernaz (4th grade) placed 13th, John Paul Cafasso (4th grade) placed 11th, Ava Sutter (6th grade) placed 11th, and James Glockenmeier (8th grade) placed 8th. Ashton Bernaz (2nd grade) and Giuseppe Milelli (3rd grade) had noteworthy races, running up in older age groups and placing well, regardless! Our next meet is in two weeks, hosted by Holy Trinity in Mountainside.